JERUSALEM: Prince William began the first official visit by a British royal to Israel and the Palestinian Territories on Monday, facing the challenge of navigating deep political and religious divides in a Holy Land once ruled by Britain. 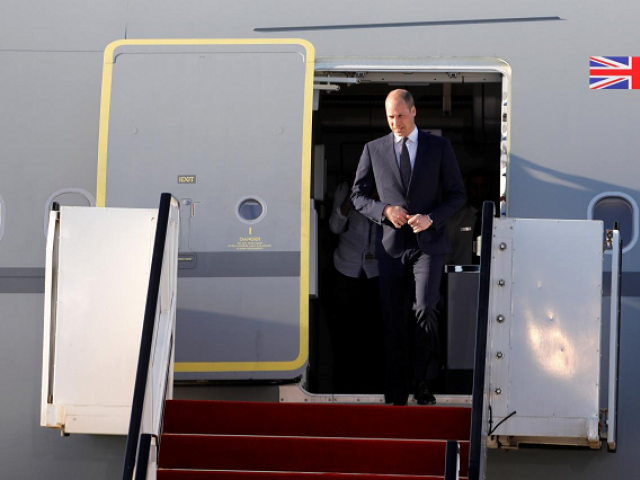 A spokesperson for the prince, acknowledging the “well-known” and “complex challenges” in the Middle East, said William’s tour, like other visits abroad by members of the British royal family, will be non-political. In remarks to legislators on Monday before William’s arrival in Israel, Prime Minister Benjamin Netanyahu said “we will of course welcome the prince” on “a historic visit”, and he paid tribute to Princess Alice, as one of the “righteous among the nations” who saved Jewish lives during the Holocaust. William was not accompanied to the region by his wife, Kate, who gave birth to a son, Louis, in April. The couple have two other children, George, aged four, and Charlotte, two. The visit comes just after Israel marked its 70th anniversary of independence and amid surges of violence along the Gaza border, including rocket attacks by Palestinian militants and Israeli air raids. William will stay at Jerusalem’s King David Hotel. Once the headquarters of British authorities, it was bombed by Jewish militants in 1946. More than 90 people were killed. The trip is at the behest of the British government. Until now it had been British policy not to make an official royal visit until the Israeli-Palestinian conflict is resolved. “In a sense, in challenging times it’s all the more important that friends of the region show their interest, show their engagement for the long term, and I think that’s exactly what Prince William will be able to do,” Britain’s Consul General in Jerusalem, Philip Hall, told Reuters. William begins the first full day of his visit, on Tuesday, at Yad Vashem, Israel’s memorial in Jerusalem to the six million Jews killed in the Holocaust. Accompanied by Britain’s chief rabbi, he will lay a wreath in its Hall of Remembrance and meet two Holocaust survivors who were given refuge in Britain as children. The prince also meets Netanyahu on Tuesday and will see Palestinian President Mahmoud Abbas in the occupied West Bank during the trip. William’s itinerary includes visits to Tel Aviv and adjacent Jaffa, where he will meet young Jews and Arabs and view high-tech products made by Israeli start-ups. Tom Segev, an Israeli historian, said some Israelis feel resentment over what he described as the British royal family’s boycott of Israel over the years. “I don’t expect many Israelis to stream out on to the streets and greet the car of Prince William. He will be treated as some celebrity of course, obviously, maybe some exotic eccentric curiosity,” Segev told Reuters.